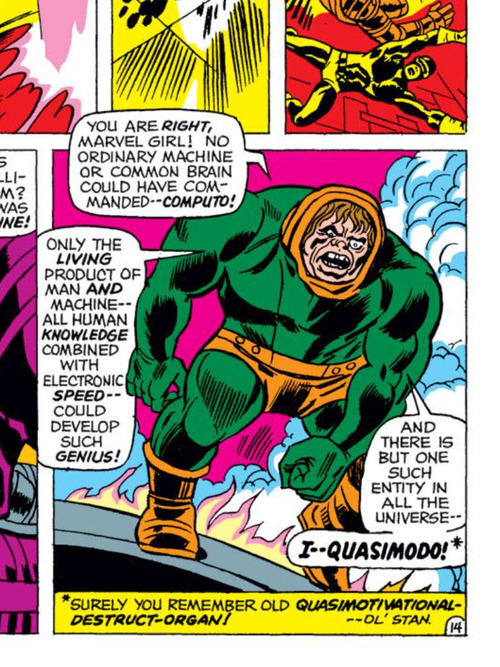 *Quasimodo: In the Marvel Universe, Quasimodo is a robot that was created by the Mad Thinker. Quasimodo was given a semi-humanoid cyborg body by Silver Surfer. Quasimodo hates humanity because he wishes to be human. -Powers: Quasimodo is highly intelligent and is very good at inventing robots. 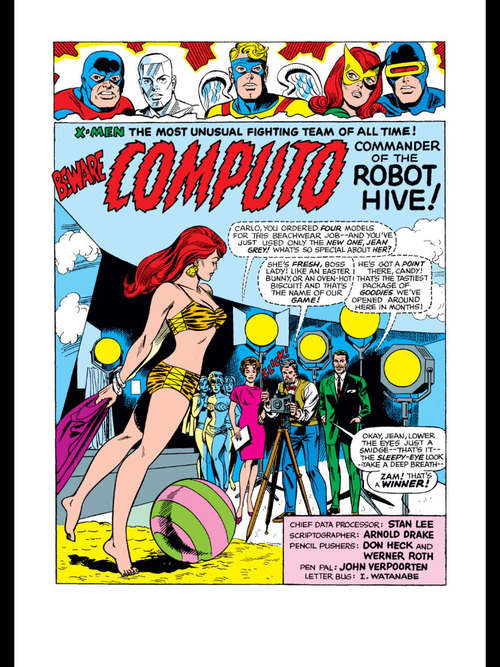 This issue begins with jean Grey beginning her new job as a supermodel. While at a photo shoot, a photographer hits on Jean and Cyclops shows up just in time to beat the creep up. Cyclops then tells Jean the great news that he just got a job as a radio DJ. Cyclops brings Jean to the radio studio, but her tour is interrupted when two robots break into the studio to steal some electronic equipment. 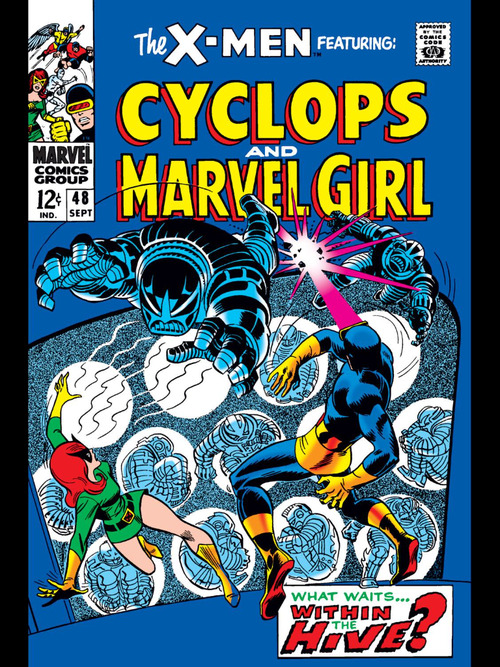 Cyclops and Jean get into costume, destroy one of the robots, and then follow the other robot to its lair. When they get to the robot lair, they face off against an army of robots. Cyclops realizes that the robots have a robot leader so he destroys the one in command. Quasimodo then appears out of the giant robot leader’s destroyed body. Quasimodo then floods his base and flees. Cyclops and Jean escape the lair just in time. The issue then shifts gears and shows us the intricacies of Beast’s powers. We learn that Beast is able to climb nearly smooth surfaces because of his extreme finger strength and flexibility. Beast is also able to jump from high distances and land on his feet because his gigantic feet can absorb the impact without injury. 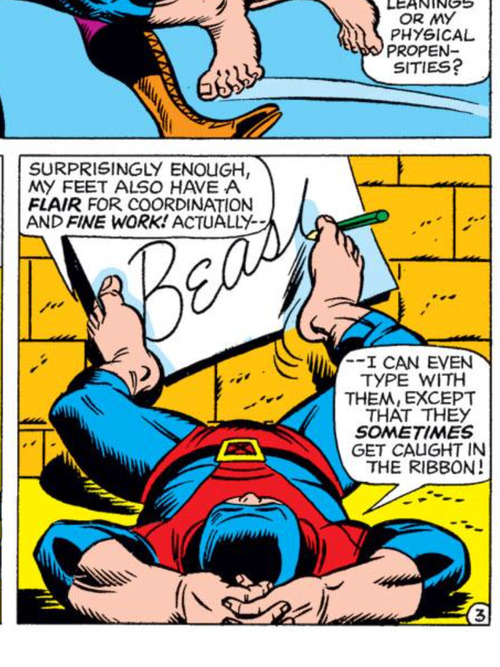 Finally we learn that Beast’s feet are just as flexible and useful as his hands. The actual storyline in this issue was pretty terrible, but I absolutely loved Jean and Scott’s new jobs. I thought it was hysterical that Cyclops is a DJ now. 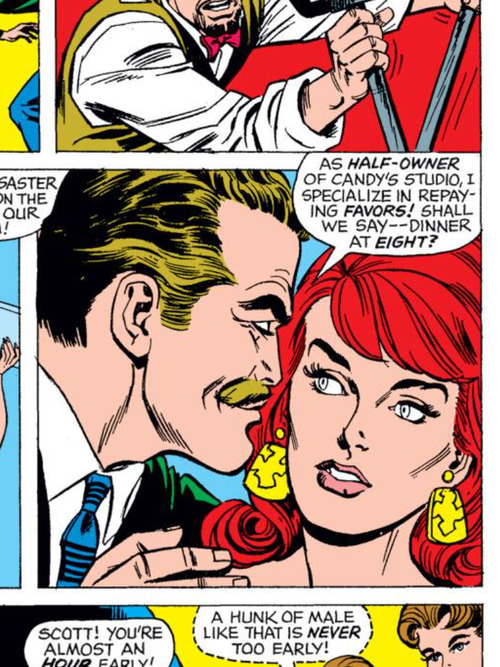 Also, although it seems a bit sexist that Arnold Drake would make Jean a model, it is pretty funny and great that she is one now. 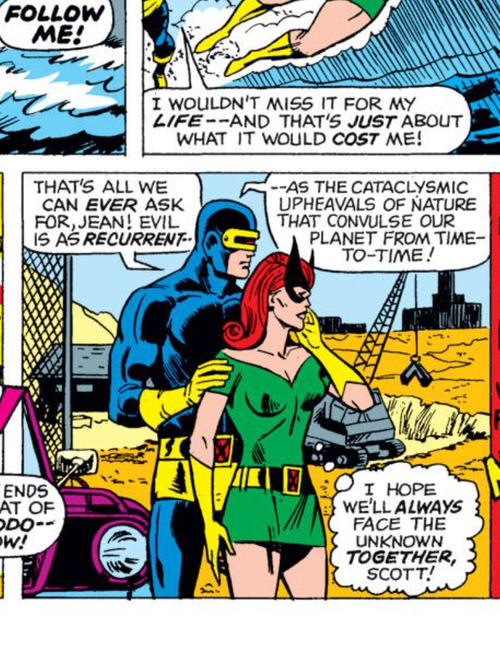 And the best part of the issue is that CYCLOPS AND JEAN ARE FINALLY TOGETHER! It seems like they are actually boyfriend and girlfriend now. It took 48 issues for this to happen, but I am super pumped that it finally did. As I said above, the whole storyline with Quasimodo and the robots was pretty horrible. The robots were very bland and easily defeated and Quasimodo was only in the comic for 3 panels. I know that this is Drake’s first issue as an X-Men writer, but he better think of better villain ideas for the rest of his run. I wasn’t the biggest fan of Beast’s power panels because Beast’s powers were already pretty self-explanatory. He is smart, flexible, agile, and strong. We all already knew that. I would’ve rather heard more about Beast’s origin story than about his powers. Even though the villains were bad and Beast’s part was boring, I still give this issue a 3 out of 5 because all of the new Jean-Cyclops stuff was priceless. 1. Here’s some more Jean modeling some bathing suits for you fan boys out there. 2. Jean has been stopping random accidents from happening at her new job with her telekinetic powers. 3. All the models love Cyclops and you can tell by Jean’s expression that she is not pleased. 4. 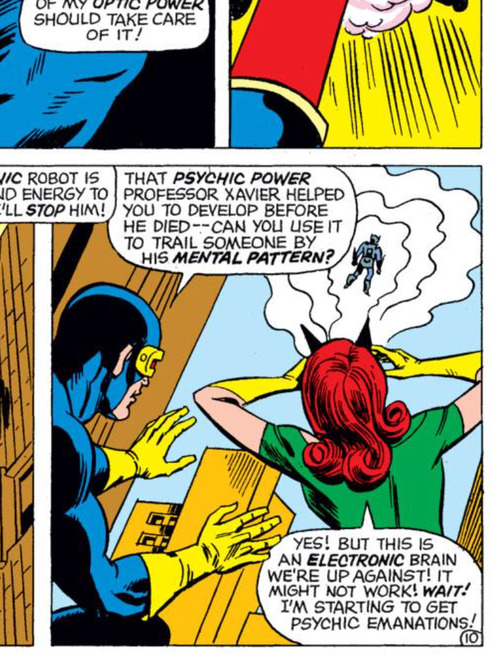 Apparently Jean can also probe the “mind” of robots for some reason, just like Professor X could. 5. I absolutely love this Jean-Cyclops panel. Quasimodo has always had potential, but I’m not sure he’s ever been used well. 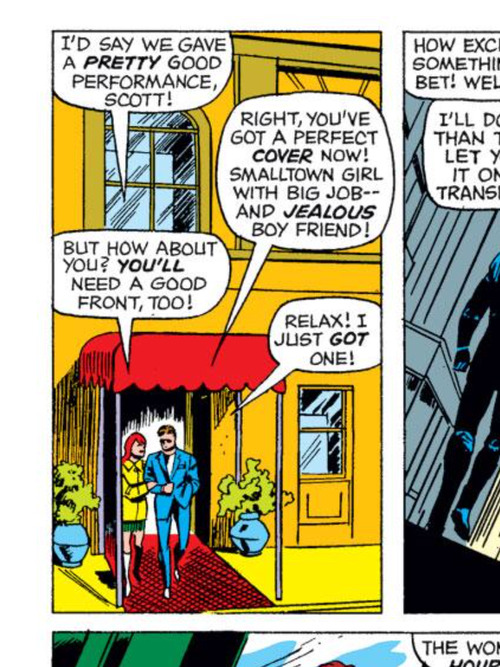 Scott and Jean’s professions sound hilarious, because I really can’t imagine them doing either of those jobs. I wonder what kind of music Scott likes and what kind of clothes Jean likes. I agree that Beast’s origin story would have been cool. 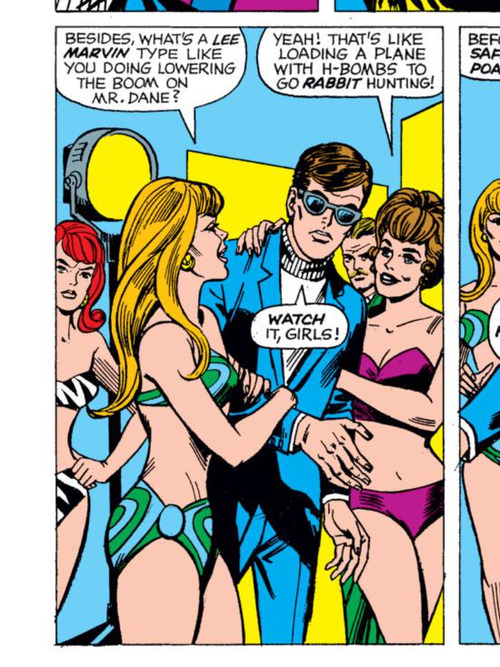 “Model” was pretty much a default profession for attractive comic-book women back then. Yes, it would be fun to know what Scott thinks is cool music. It’s a bit ridiculous that they couldn’t think of other jobs for female characters to have back then. At least Sue Storm is a scientist. That was the movie. In the comics she was an actress (I remember her as a model too, but couldn’t find any confirmation in my Essential FFs). It is sexist, but the range of “female” jobs back then was limited (model, actress, secretary and so on) and the resistance to women doing anything else was intense. It’s a good thing we’ve reached the point where people actually notice the sexism. Yeah thank god that point in time has finally come. Yeah I really hope they show what songs Cyclops chooses in a different issue! Yeah it totally is. Jean is smart. She could definitely do well in another job too. Of course, Famke Jansson who plays Jean is a model and an actress!